A prostate biopsy report must identify the patient, doctor, and date of sampling. To help assess the adequacy of the sample, the report must also provide the regions from which the cores were taken and, very importantly, the number and length of the cores taken. This information, along with information prostate size measurements, typically from the ultrasound done at the time of the biopsy, helps determine adequacy of the sample. Depending upon suspicion, if the sample is inadequate, it may be wise to repeat a negative biopsy. 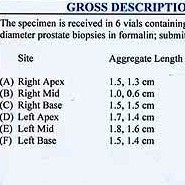 Elements of a prostate biopsy report combine with prostate size measurements to form a test of sample adequacy.